I am vacationing in France but feel like I am shopping at Winners or TJ Maxx. You know what it’s like shopping in those stores? I find a pair of DKNY jeans for $10 and quickly look for the label, “Compare at $75”. I love the “compare at” label ~ it makes me feel like I got an even better deal than paying only $10 for jeans. That’s the way I feel shopping for wine here in Antibes, France. The wine is inexpensive and I feel like I’m in the clearance section of Winners. 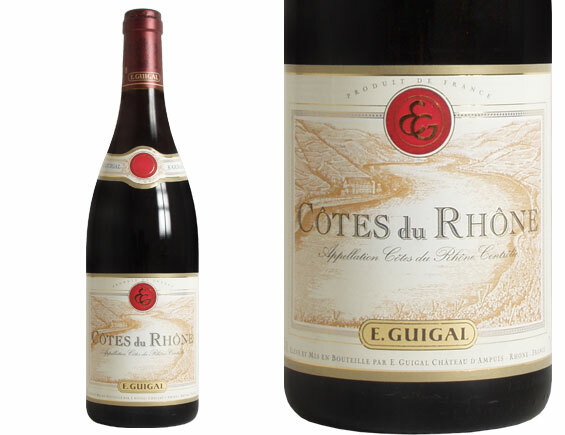 Guigal Côtes du Rhône, €7 ~ compare at $16.95. Now don’t get me wrong, if you want a great Cotes du Rhone (and everybody should) then go to the LCBO and get Guigal’s. It is a nice blend of Syrah / Grenache / Mourvèdre and will take you to France on a warm summer evening. We are about to embark on a side trip to Antibes, France. I am prepared again for some french lessons. Yes, I will learn some new words, some new wines, and some new foods – but what I will surely be taught is some panache and Monsieur Roger will be teaching me again. Roger is the guardian of the house that we rent. I have introduced him before. A Parisien – he knows food, wine, gardening, and married well (a beautiful Brazilian professor).It was Roger that taught me French Lesson #1 on his favourite wine – “It depends what you are eating”. Last time we visited he asked us, “Did you like the flowers that we left for you?”. My wife and I looked at each other. We didn’t remember any flowers in the house. Did we miss them? Was Roger mistaken? We looked at him puzzled. “The flowers, in the fridge” he replied. Of course Roger was referring to the bottle of Tavel (local rosé wine) that he had placed in the fridge for our arrival. Who but the French would use simple, beautiful, poetry to describe a bottle of wine in the fridge ( it does sound way better than the American version “Did y’all get the wine we left fer ya?”). Thanks Roger for Panache Lesson #1 – I hope I come back from France a better man. I think my wife would approve of a little more panache in my life. Tavel lies to the northeast of Avignon on the right bank of the Rhône. A viticultural area first introduced to vines by the Romans, the appellation’s 2,000 acres were set forth in 1935 under A.O.C. law. 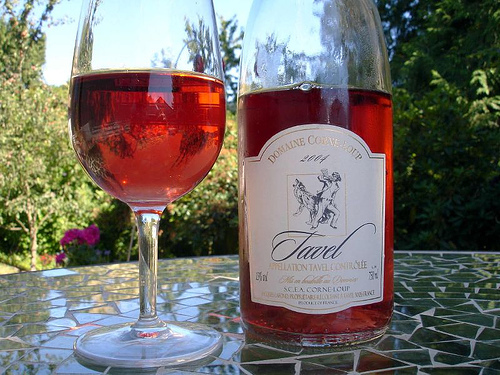 Tavel’s sole designation is for rosé wines, which are produced from a blend of red and white varieties grown in extremely arid soils characterized by hillocks of sand over a chalky clay subsoil. The long growing season and intense, sunny summers yield fruit of exceptional ripeness, concentration and intensity of flavor. 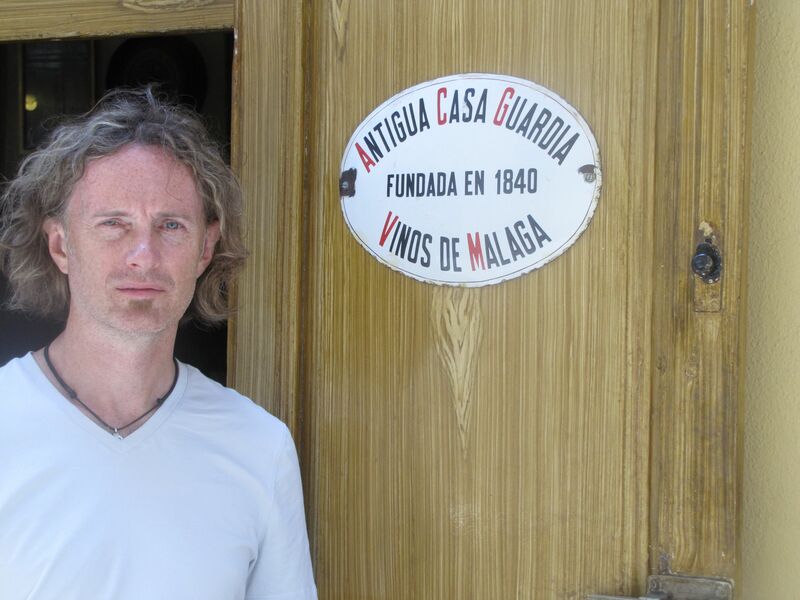 My favorite Malagueño, Mario, read my blog and told me that I need to write more about Malaga wines. I am inclined to listen to Mario so I headed to Casa de Guardia in the heart of the city. It’s 10:45 and I am not the first person in the local wine bar. Now to be fair, I have been awake since 6 am since I wake up early every morning excited to be in Spain. 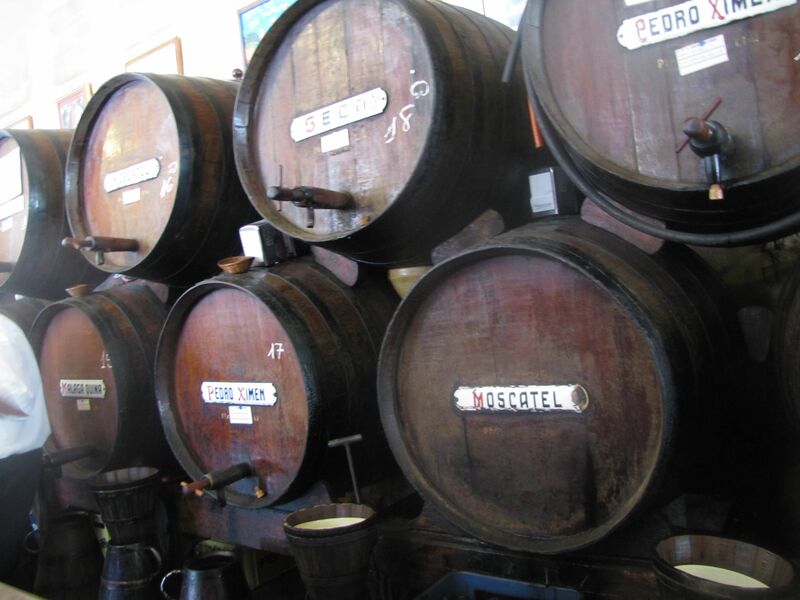 The Antigua Casa de Guardia is authentic – it looks like the walls are held up by the photos on them and the barrels like they have been there since 1840, as do some of the patrons. This is not a glamorous NYC wine bar. The selection of a dozen Malaga wines range from very dry to molasses sweet . Your server writes the bill in chalk on the bar and then erases it with his hand after you pay. It is so cool! The portions are small so that you can try a couple of different styles. Any wine lover visiting Malaga must make this a destination. It’s hard not to judge a culture by your own culture’s standards and since I am North American here goes. There are at least two things about Spain that I can’t explain. One is the dogs. Everybody has one. I understand that. This is a country with bars on its windows and doors. Breaking and entering into a hacienda style house with a small fence seems easy enough to do. Nothing like a large German Shepherd to make you think twice about that. What I don’t understand is why nobody tells the dogs to shut up when they are barking. People actually take a break in the conversation and let the dog finish. Not even a “quiet down”! The dogs just bark and bark – outside my window at 5 am they bark and bark. I am learning the Spanish for “shut up you stupid dog” before I go to bed tonight. The second thing I don’t understand is how I could purchase a bottle of wine – Echave from Navarra – for 73 euro cents AND the wine is good! 73 euro cents. The cheapest bottle I can find in the LCBO is just under $7 and it’s not very good. Even with a bad exchange rate that bottle I drank last night cost me $1. I even splurged on the Reserva for $3.40 just because it seemed silly not to. So I double dare our Ontario wineries to make me a drinkable wine that costs me $1. Furthermore, I double-dog dare the government not to tax that bottle up to $7 just so that I can have “free” health care. And speaking of double-dog dare, “Cállate estúpido perro”. Did you know that this is NOT the official flag of Spain? 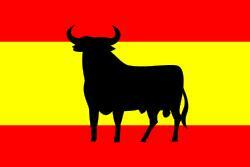 In fact the black bull on the flag is the black bull logo of Bodega Osborne, the largest producer of Spanish brandy, sherry, and wine. Large billboards of the bull’s outline perched on hillsides throughout the country have become a national symbol. Imagine that we in Canada put a large Labatt’s Blue symbol where the Maple Leaf goes (actually maybe Molson Canadian already did that). 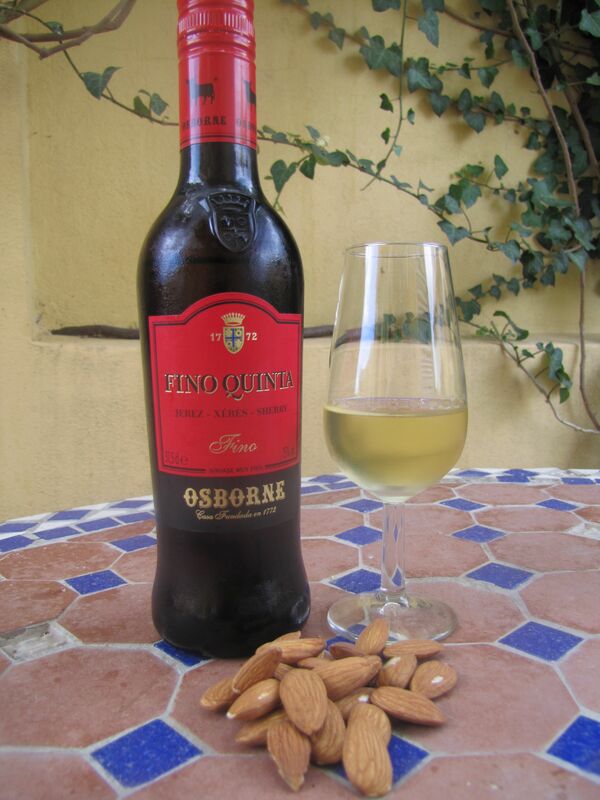 Fino is a dry sherry – bone dry – that is often served with fish or as an aperitif with tapas. You can almost always get Tio Pepe at the LCBO but it might be worth it to wait for a fino from Emilio Lustau to show up in the Vintages section. 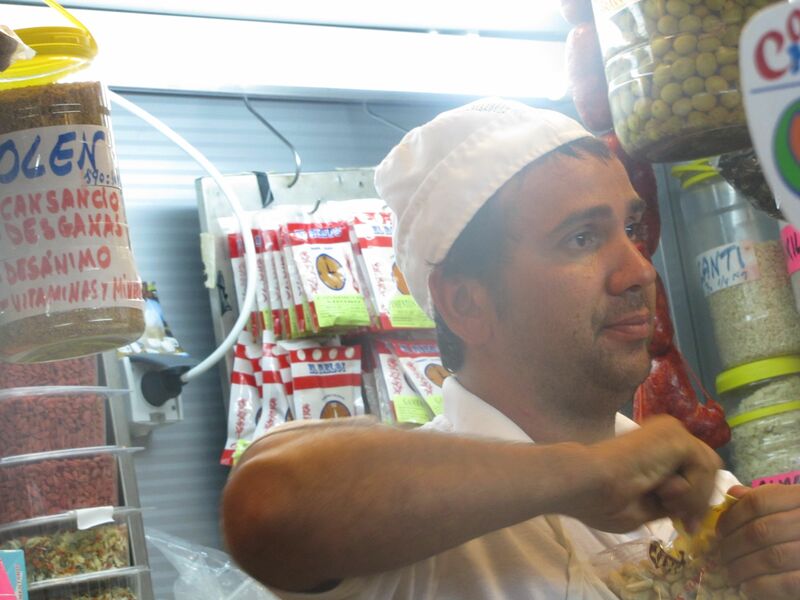 My favorite Malagueño is my olive vendor Mario. 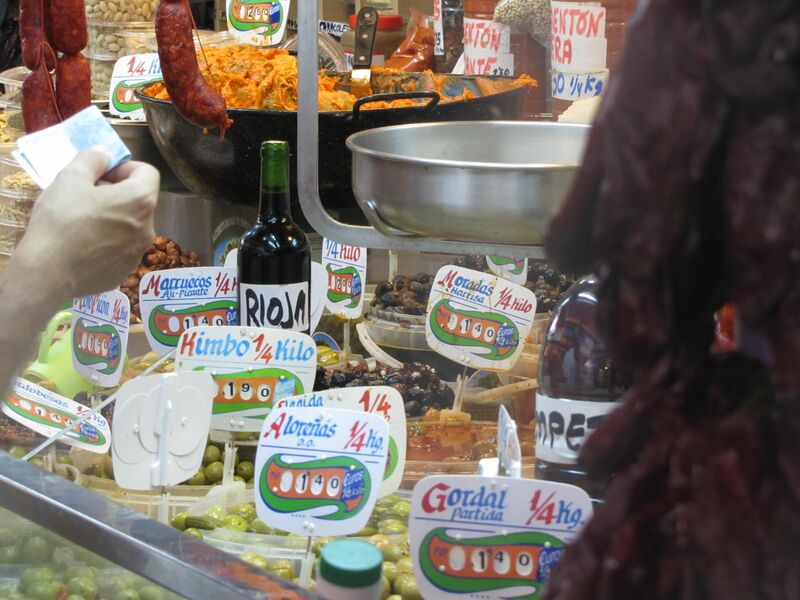 This man knows how to bring a smile to your face – and with a dozen men competing to sell olives, in the largest olive producing region in Spain, that’s important. 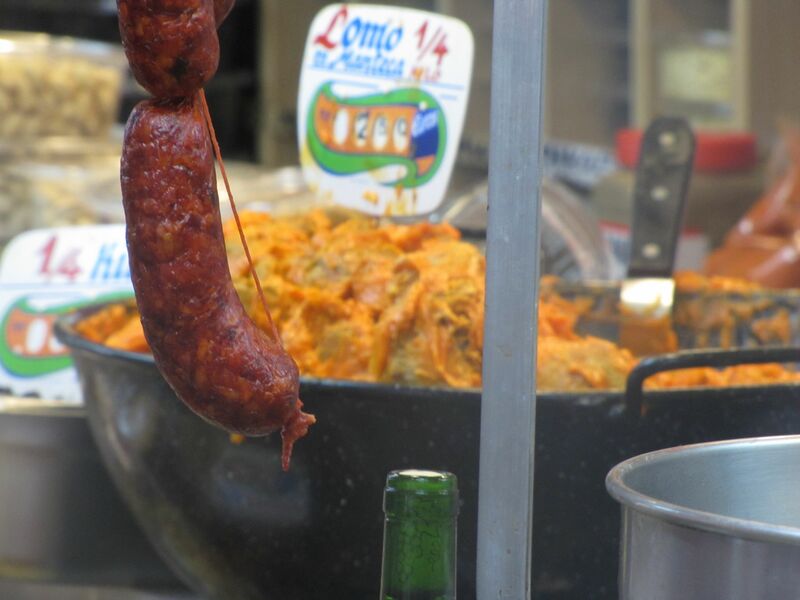 Mario gave me an olive dusted with smoked paprika that was so big you could make a meal with just two of them. 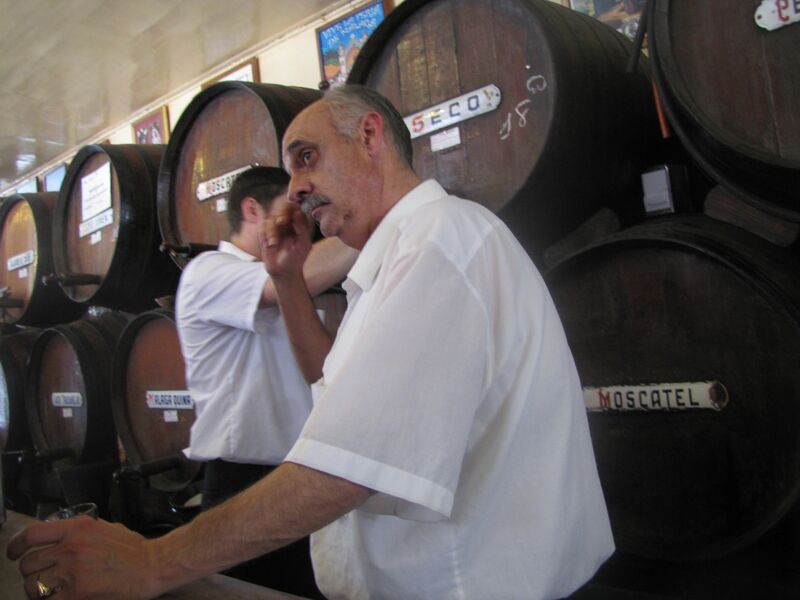 As I was enjoying the smokey flavours Mario pulled a wine skin down from the wall behind him and explained that the real Malagueños drank Moscatel, a local sweet wine, after eating olives. 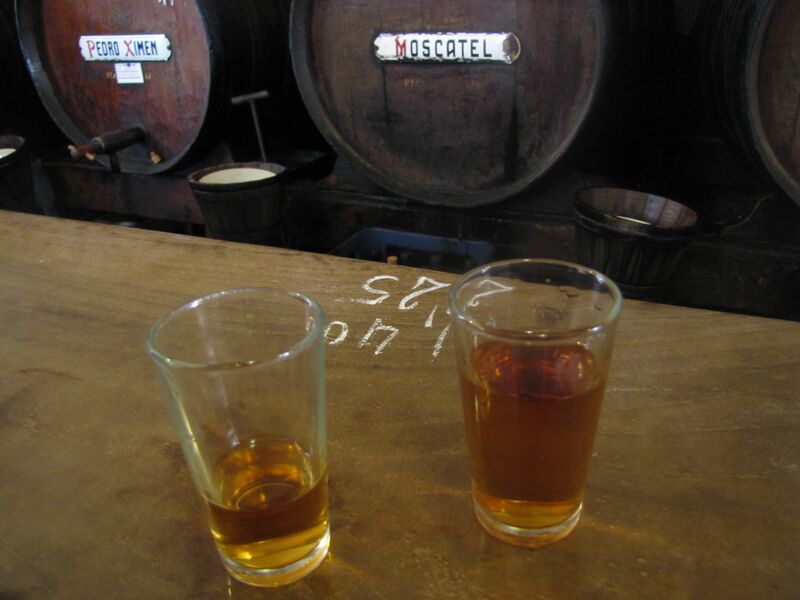 He proceeded to skillfully pour a stream of moscatel into his mouth at arms length! Then he passed me the wineskin! 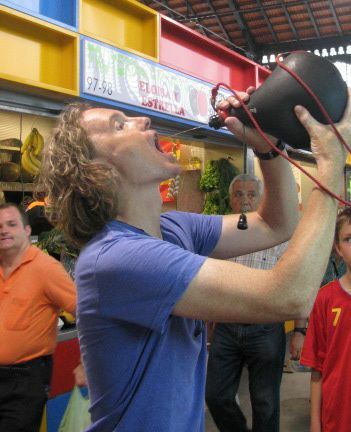 How I didn’t get red moscatel all over my face and t-shirt during my first effort drinking from a wineskin I’ll never know. What I do know is that the smile still isn’t wiped off my face from meeting Mario. 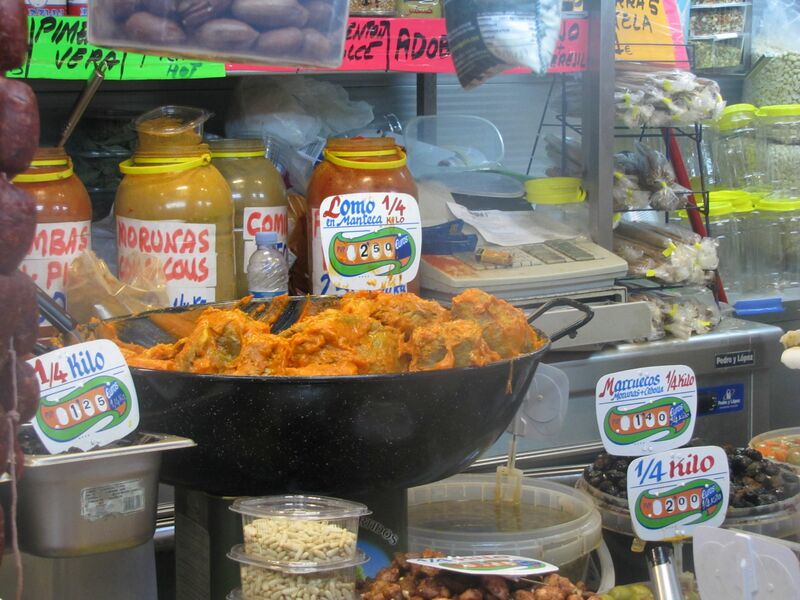 Today was my visit to the fantastic market in Malaga. I guess the weird thing is that the coffee / tapas bar is in the fish section. You know the coffee is good when they can serve it near fresh/stinky fish. 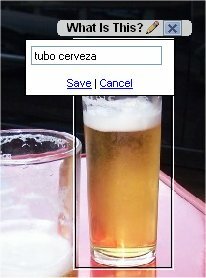 My brother in Spain and I went to the bar to come up with a buying plan for dinner. 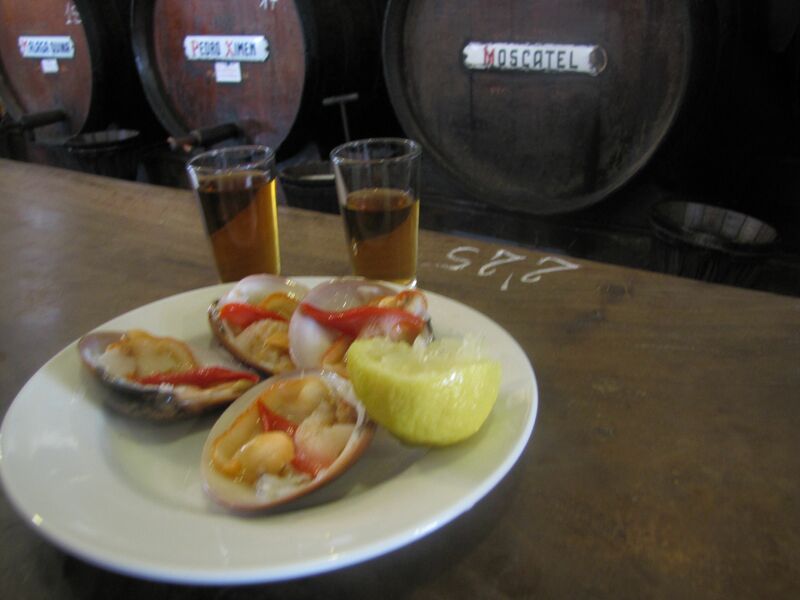 While enjoying my Tubo (beer in a long glass) and tapas of anchovies in oil – we listened to an old man complain about the referee in Spain’s last game – not enough yellow cards – and about the guy who’s refereeing the next game – too many red cards. So far it’s just like being in a bar in Canada with futbol instead of hockey.